We at Hexes & Bows want to take a moment to wish everyone the happiest and merriest of Holidays this winter season! No matter what you celebrate, we hope you find some time to play games and share the things you love with people you love as well! There are lots of things bubbling in the H&B creative cauldrons! First, we’ll be resuming our standard tabletop discussion podcast and releasing these episodes biweekly. Don’t fret! We’ll still be publishing more content every week! The second pot-a-brewin’ is our reviews! There’s loads of items for Mr. and Mrs. Gnome to go over and many more in the works! If there’s something you’d like us to tweet us your suggestion at: @hexesnbows! Finally, we’d like to take a moment to thank everyone who filled out an application to join the Hexes & Bows Actual Play Podcast! We’ve been working on building a new creative team, and although we’re still determining the setting, we are so excited to join the actual play podcast world! Our next D&D live tabletop game will be this Saturday, December 30th at 6PM CST! Cersten, Billy, and Crash now join Tony, Tara, and Chrissy as they learn of their character’s destiny with the Feywild Queen! Join us for the last D&D game of 2017 on twitch.tv/gnomedic. From the bottom of our hearts, thank you for supporting the Hexes & Bows Podcast. 2017 was an incredible learning experience and 2018 promises new content, new cast members, and more tabletop love! Merry Critmas to everyone, May your shelves be full of games and your table surrounded by friends and family! Hexes & Bows Podcast is BACK! We are beyond thrilled to be back behind the mic talking tabletop shop! Tara and Gnome team up to review Cantrip Candles, created by Christoff Visscher! These scents aid in immersion gameplay for your tabletop adventures and boy do they trigger some great gaming memories! Give this episode a listen and try out Cantrip Candles for yourself at: http://www.cantripcandles.com. Cantrip Candles, made by Christoff Visscher, are 100% soy wax candles for enhancing your tabletop gaming experiences by immersing players into their various surroundings found within fantastical worlds. Currently, there are ten different scented candles available for purchase and Cantrip Candles sent us their sample pack for review! Both Tara and Gnome enjoy immersive gaming products, often implementing them into their tabletop games to help create memorable gaming moments. They’re no amateurs when it comes to using scents for gaming, and both hosts agree that Cantrip Candles encourages another of enchantment while roleplaying. How someone sells a product can be just as important as the product itself. In this case, Cantrip Candles does an excellent job with their packaging and marketing. Each candle is poured into a circular tin wrapped in a cardboard sleeve with a special map drawn on top. The labeling is incredibly rustic and the map is an excellent added touch that gives each candle its own personality. The scents are labeled with the name of the candle and includes the average burn time! Not only do the scents offer creative names, they’re also accompanied by a little story that helps stir the spirit of storytelling. Tara is our resident candle expert and understands the pouring process and use of different elements to create a high-quality candle. In the case of Cantrip Candles, aside from a few non-centered pours, these 100% soy wax candles hold up well after several months in storage. Of the samples we received, each scent changed after being heated, some for better or for worse, but they each maintained a pleasant aroma that permeated rather quickly throughout the area. The scents we received all represented the scents described on the website, some being more obvious than others, but all appropriately advertised. Each candle costs $14 for a 6oz tin that lasts around 30-35 hours when burned (of course, only burn your candle for about four hours each time!). Many candles we’ve found online, be they mass-produced or from Etsy, vary in price, but for $14, this was an incredibly reasonable price for a small-poured batch, 100% soy wax candle. Overall, Cantrip Candles really stacked up well for us at Hexes & Bows. We are already fans of immersion products and these candles are well worth the purchase with a final score of 4.83 out of 5. If you enjoyed this review and want us to try out out other gaming products, leave a comment below! December 8, 2017: Extra Life 24 hour charity gaming marathon begins at 8PM CST on twitch.tv/gnomedic! Help us raise $1,000 for sick and injured kids at CMNHospitals! We’ll have raffle prizes such as dice, dice mats, painted miniatures, and more for donors and will be playing a D&D 1-shot audience-participation game, along with games like Overwatch and Minecraft. Come play games, cheer us on, and help raise money for amazing kids! 100% of proceeds goes Extra Life. You can donate here! December 16, 2017: Hexes & Bows Live D&D 5e Campaing on twitch.tv/gnomedic continues! Join Grohl, Talial, Teak, Makaria, Ricochet, and new adventurers Lyllah and Bulwas, as they finally sit down and uncover the mystery of the Feywild Queen, Subu. Show starts at 5PM CST! Continue the conversation with Hexes & Bows on social media and get connected for additional updates, news, reviews, and more! Action Cats is the latest project created by well known roleplaying game designer and author Keith Baker. Action Cats is currently being funded on Kickstarter until August 1st and it is all about the Internet’s most beloved animal – cats. You can listen to Keith Baker talk about the project on Tales from the Fandom podcast below. It’s a family friendly storytelling game where it is up to you to craft the best story. You’re given the beginning and the end of the story, but you fill in the story. The judge determines who has the best story! Video on how to play Action Cats! Gnome and Tara get their hands on Manicdotes!. This social, storytelling card game is a fun way to kick-start your game night! Gnome and Tara invited a few friends over to play this social, storytelling game! After several rounds, Tara was the victor and both she and Gnome had a solid understanding of the overall purpose of the game! As with all of the Hexes & Bows reviews, Manicdotes! was scored on five categories: packaging, components, rules, replay value, and cost. Each score is the best out of 5 with 5 being the highest, most desirable score to achieve. Both co-hosts strongly agreed that the packaging for Manicdotes! is the best overall selling point of the game. It’s bright and bold color choices along with a fun and unique font left both Tara and Gnome feeling nostalgic. The game looks like it was transplanted from the 1950s into the modern era! The components were a bit of a hit and miss. Included in the game are 150 Words cards, 30 Story Starter Cards, 6 pads of paper, 8 pencils, and a 90-second sand timer. While the colors of the cards match the external look of box and remain bright and colorful, the card stock quality was poor. After unraveling the card decks from their original plastic revealed many edges of the cards already suffered from damage. The corners of the cards were either bent, frayed, ripped, or splitting prior to shuffling. Trying to shuffle the decks was a surgical process requiring gentle hands and alternative methods of shuffling in order to prevent additional bending and folding of the cards. The 90-second sand timer was timed 10 times and each time came out at 92 seconds, which, isn’t that big of a deal since that is more than enough time to generate a tall tale with the words card! Tara was not a fan of the pencils and paper, while Gnome saw them as neither an advantage or disadvantage to the game. They’re nice to have in the game, but, according to the components list, their box was shorted 2 pads of paper. Perhaps the most important element of game is its rules. Overall, the rules and general jist of the game is relatively easy to comprehend. Players draw one Starter Story and one Words card, create a story in 20 seconds, then convey that story in 90 seconds to the other players at the table who try and guess which words in the story generated from the Words card! First player to 25 points wins! It’s that simple. Unfortunately, this level of vagueness left some questions being asked, particularly involving wording regarding the Story Cards, “topics,” and “categories,” which are not described fully in the rules, if at all. It is easy to create your own set of rules for the game and the official rules offer alternative ways to play the game or make it more challenging! As with most investments, at least between Gnome and Tara, the ability to replay a game over and over and over is exceedingly valuable. Manicdotes! can quickly become a predictable game. After a few play-throughs, a player may associate particular words with a card and simply “guess” the rest of the words in the story without having to listen properly. One way to combat this, as suggested in the rules, is by drawing multiple Words cards and then selecting the first word on each card! This method deals with the repetitive association of words that would otherwise decrease the replayability far too soon. Ultimately, Gnome and Tara collected their scores and Manicdotes! earned itself an average overall score of 3.34/5.00. Listen to the podcast for the complete breakdown of the score! You can try out Manicdotes! for yourself at www.manicdotesthegame.com! Leave a comment below if you’ve played the game! We’d love to know your thoughts on it! In this special podcast, Gnome sits down with co-author Tristan Zimmerman of Archive: Historical People, Places, and Events for RPGs on Kickstarter until June 5th! With Archive: Historical People, Places, and Events for RPGs you’ll be able to learn about exotic lands, extraordinary people, and unique events from history that may be your inspiration for new and exciting elements that help bring your RPG campaign to life! Archive is a seemingly great investment for history buffs and DMs, and, for only $10, there’s really only knowledge to gain and none to lose! The $10 backer reward will receive a pdf copy of the book and $30 will get a backer a physical print! There’s still time to support this incredibly resourceful RPG tool here! If you end up backing the book, please let us know! We’d love to learn what elements you used in your campaign setting! Tara and Joey dive right in to a pile of metal dice from Die Hard Dice for their latest review of tabletop accessories! Metal dice, rolling mats, and glow-in-the-dark die?! YEAH! We are all in! The story behind Die Hard Dice is quite sweet and humble. Todd and Jessie, founders of Die Hard, find the time to sell dice and gaming accessories in the little free time between raising children and other jobs. After speaking with Todd through a couple of e-mails, it’s very clear that he and Jessie are passionate about gaming and that they desire to share such a passion with other gamers! That’s why Die Hard Dice may be one of our favorite places to purchase dice from. Die Hard offers a wide variety of metal and polymer dice, but today Tara and Joey review three sets of metal dice, some prototypes, and a rolling mat! Straight from the tin box, these copper dice make a statement! Not only are they enjoyably hefty (it’s a word we like to use a LOT this podcast, in a good way! ), the overall look is simply eye-catching! The edges of the d6 and d10/percentile are rounded and offer a wonderful rolling experience that is often lost with jagged-edged metal dice. The same cannot be said for the d4, d8, d12, and d20s which each have very sharp, very crisp edges that really make the antique pop out within their beveled borders. With the d6 and d10s outshining the other dice, the entire set offers players a steampunk-vibe in both color and design. Ultimately, we enjoyed these dice, but could not overlook a coloring flaw that left some of the dice a more orange-copper color versus a more muted-copper color. These dice retail for $28 on their website, which is an excellent and fair price for a rather spectacular set! If there’s one unique thing about this particular set of dice it’s in their aesthetics! Raw steel sounds pretty darn epic, but holding a set of gun-metal steel in your hand feels empowering! Both Tara and Joey agree that these sets look more like a dark, ancient stone than they do metal, which increased their appeal! The deep steel color shows any wear and tear on the dice more, but that adds so much character to these dice! One aspect that divided Joey and Tara in scoring revolved around the number coloring. The website image shows a much lighter steel and a brighter blue which make them easy to read. That wasn’t the case with this particular set. For near-sighted Joey, trying to read the numbers turned into a struggle, but Tara had no qualms. Like most sets on the Die Hard website, this RPG set retails for $27! Seriously, the prices on this site are just fantastic! After opening these dice, Joey originally believed they’d sent an assortment of colors to observe. That’s not the case! Be sure to listen to the podcast and learn how this glorious set came to be! These dark, chrome dice are impressive! Their sleekness and shine make for an enjoyable rolling experience and quickly became Tara’s favorite of the bunch! The Sinister sets offer a variety of coloring to their numbers that include pink, yellow, blue, purple, orange, red, and green! It’s hard to imagine anything sinister about a rainbow, but that’s exactly what you get with this dice set! They’re molded similarly to the Raw Steel sets and are the most uniform in size and color. No blemishes appear on these dice, so they look fresh and ready for action every time you pull them out for game night! Retailing at $27 as well, this is a must-have set for any type of dice collector! Todd’s ability to think outside the box and problem solve is very apparent in the products that he sells and creates. Even though it’s the cheapest item on the site it’s one that is worth so much more than $6.50! The Die Hard playmats are the PERFECT, cost-effective solution to rolling metal or other heavy, sharply-edged dice on a variety of surfaces. Not only is the playmat well-crafted, the simplicity of its use makes it a must-purchase for players concerned with rolling dice on tables. A rubber backing helps keep the playmat secured to any surface, so while you roll your nat 20s, it’s not rolling with! Plus, the mat acts as a sound dampener and a spring board for dice. What does that mean? It means every time you roll your straight-edged dice they won’t just land with a thud! Instead, you’ll achieve an actual roll! Additionally, if you’re like Joey and lack space on the gaming table for a cool dice tower or tray, this is the perfect solution for a cramped table! One word of advice regarding these dice mats is to let them air out in a garage or outside for about 24 hours. There is a very strong rubber odor. Joey and Tara both recommend giving this product a try! You can order one here! 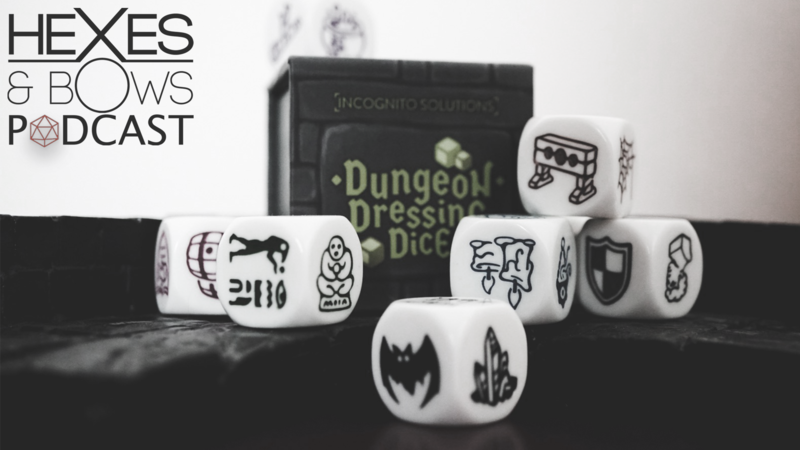 Overall, Joey and Tara agree that Die Hard Dice offers a fantastic array of fairly-priced, quality metal dice, innovative solutions to dice problems, and the best customer care and service you’ll every find on the internet! These dice sets will make for spectacular gifts or a wonderful addition to your collection. Peruse through Die Hard’s website and find the perfect set of dice for you at: www.dieharddice.com. Use the code FREEDICEMAT and receive a free dicemat on orders $25 or more! Mandalorian Merc Costume Club member and Star Wars expert, Darryl Vincent, joins the Hexes & Bows cast in today’s episode! Due to technical difficulties (blame it on the Jawas) much of the footage was lost. However, thanks to a diligent gnome and some digital duct tape, we’re still able to enjoy the conversation with Darryl about his experiences with Star Wars: X-Wing, Clone Wars, and some old-fashioned AOL roleplaying! We appreciate your patience with this episode and hope you enjoy it! If there is anyone that knows anything about Star Wars it’s Darryl! An Army veteran and (as Gnome proclaims) Star Wars expert, Darryl joins the Hexes & Bows Podcast to share his experiences and adventures into the exciting world of costume building with the Mandalorian Mercenary Costume Club. Darryl also talks about playing Fantasy Flight’s X-Wing miniatures game and drops some insight on the Clone Wars cartoon. To learn more about Darryl and the awesome things he does, check out these links! Stay up-to-date with the latest happenings involving Hexes & Bows! Everything from awesome photos to game schedules, there’s plenty going on within the H&B community!